I'm still collecting my thoughts on the 2014 ALA awards (weren't the Batchelder books the best? ), but in the meantime, here are my nine-year-old daughter's. She joined me in Philadelphia after my committee work was over and got to share in the excitement of the awards ceremony--and the early wake-up call. I recommend trying to figure out what will win one of the awards. Just one, though--trying to guess the Newbery and the Caldecott would be too much. I was on a Mock Caldecott Committee at my school this year and had read the winner and honor books, which made it exciting when they were announced. 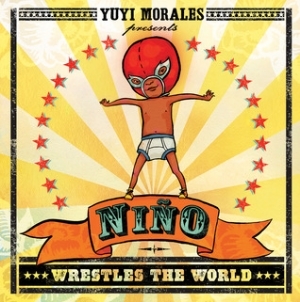 Also Knock Knock, which won the Coretta Scott King Illustrator Award, and Nino Wrestles the World, which won the Pura Belpre Illustrator Award. They could have won the Caldecott, too. Pick another award that you don't know a lot about and find out more about it. 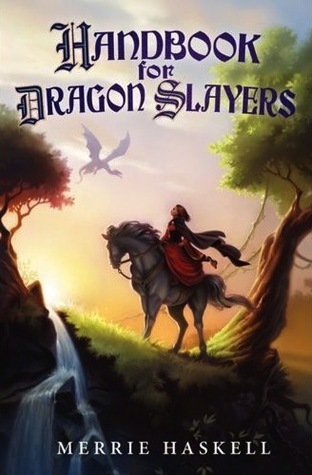 I didn't know about the Schneider and Stonewall Awards, but now I want to read some of those books, like Handbook for Dragon Slayers. Think a lot about the awards and what it would mean to you if you won one. Look around you and just enjoy it. There was a man on the Odyssey Award committee sitting across the aisle from me and he was enthusiastic about everything. That was great! Booing is not right. There should be lots of applause for every book that wins, even if it was not your favorite. The audio of Scowler was just creepy. [Me again.] Out of the mouths of babes. I pretty much agree entirely, and especially with her point about the CSK and Belpre winners. Do you have anything to add? Today is Santa Lucia Day, which may or may not mean anything to you depending on whether you're Swedish. I'm not, but my husband's grandfather was, and we celebrate the day with Santa Lucia buns and books (I've written about Lucia and the Light by Phyllis Root and Hugo and Josephine by Maria Gripe here in other years, but somehow haven't gotten around to Kirsten's Surprise by Janet Shaw, from the American Girls Collection. Maybe next year). My son outgrew his starboy hat a couple of years ago, but my daughter still wears her (battery-operated) crown. 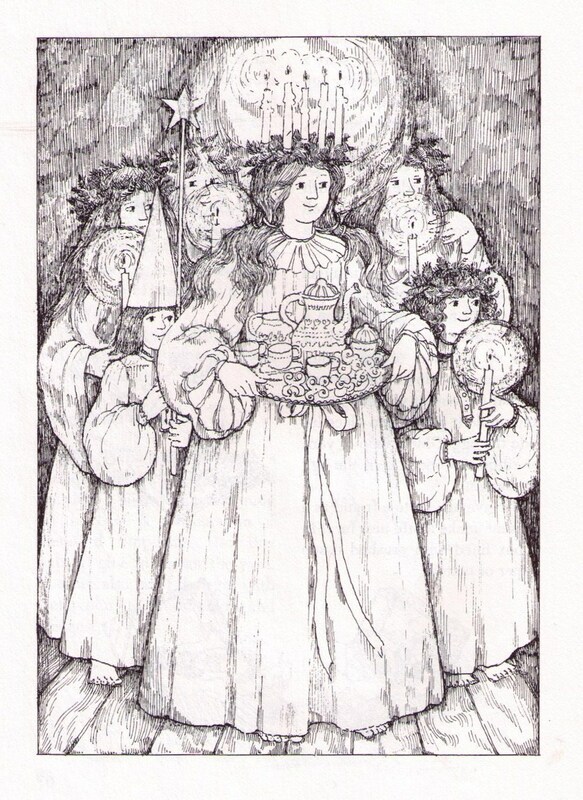 This lovely image of a "Lucia bride," wearing the traditional white gown and crown of candles, is by Anita Lobel, from Christmas Crafts: Things to make the 24 days before Christmas by Carolyn Meyer (Harper & Row, 1974). It's one of my favorite Christmas books, with international Christmas traditions and projects for every day. Some of them are a little dated (there's macrame), but many others have become our family's Christmas traditions, too: from making homemade advent calendars (December 1) to decorating a tree for the birds (December 23) and baking a chocolate yule log (December 24). Lobel's black-and-white illustrations (and there are lots of them) are a big part of the charm of Christmas Crafts. I love Lobel's work any time of year, but at Christmas, don't miss her illustrations for The Night Before Christmas: A Victorian Vision of the Christmas Classic by Clement C. Moore (2000) and The Stable Rat and Other Christmas Poems by Julia Cunningham (2001). Come to think of it, A New Coat for Anna by Harriet Zeifert, with pictures by Anita Lobel (Knopf, 1986) is a Christmas story, too--and it's still in print. Happy Santa Lucia Day! I had been reading one chapter a night of Jostein Gaarder's The Christmas Mystery (1992; translated from the Norwegian by Elizabeth Rokkan, 1996) aloud to my daughter this advent. Sadly, we only made it to Day 6. The premise of Gaarder's book is good (if structurally familiar to readers of The Solitaire Mystery or even Sophie's World): Joachim discovers a magic advent calendar (yes! a magic advent calendar is good) in an old bookstore. Behind each door is a picture--and a tightly folded piece of paper telling another story, about Elisabet's journey across Europe and back two thousand years, to Bethlehem at the time of the Nativity. Eventually Joachim's and Elisabet's stories interwine, but we didn't make it that far--Elisabet's story was a lot less interesting (or more philosophical) than Joachim's. Maybe I'll try again on my own, since I can read a lot faster than I can read aloud, although I am probably less patient than my nine-year-old. Note: We are reading the English edition, illustrated by Rosemary Wells. The illustrations are not as magical as I would like, and other reviewers agree, preferring Stella East's illustrations in the Norwegian edition pictured here (Aschehoug, 1995). Maybe that would help?